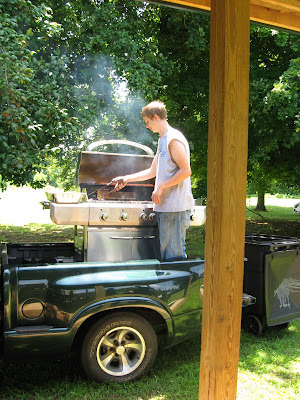 Grilling in the Back of a Truck? Yep! We had our annual cook out at the church to honor military members. The shelter was my son's Eagle Scout project. My coach from Little League (many years ago) helped him learn how to build, and a lot of young men from the community pitched in to build the picnic shelter. The picnic tables were just completed. The shop class at the high school made those. They are big, sturdy tables and should last forever or close. A guy I graduated from high school with brought out his grill, and his son did the cooking. 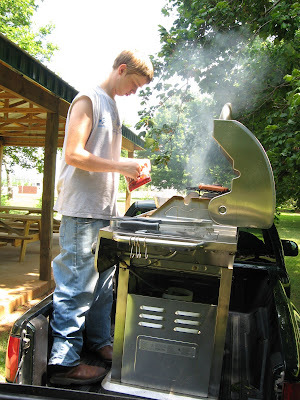 My Dad always did the grilling, but he died two years ago in a wreck. This is the first time I've ever seen anyone grill on gas in a truck. Not beside. I really do mean "in" the truck. I can't speak to the safety on that. I do tailgate and often, but I must say I've never thought to cook right in the truck. Then again, my truck is a SUV, and that wouldn't work out at all. 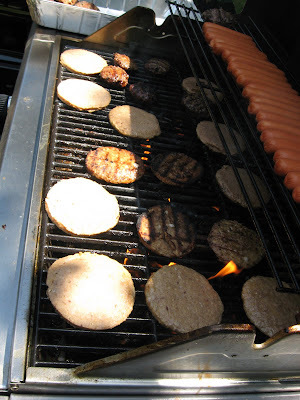 There were loads of burgers and hot dogs, as you can see. Very yummy.